Here’s the recap on our Halloween night. Lucinda dressed as a zombie jester and went out with one of her friends and the neighbors. 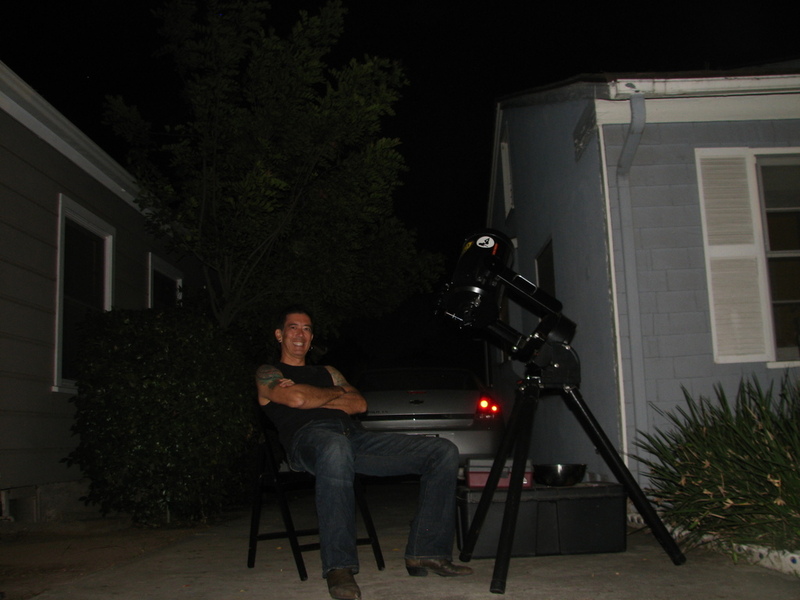 I set up my telescope in the driveway and handed out candy and and looks at Jupiter and the nearly-full moon. When Lucinda got back, she weighed her bag, and she had five pounds of candy. We spread it out to do the inventory. It was a fun evening for both of us. Wednesday was a Staff Development Day in the Pasadena schools, so Lucinda and her friends had a day off. And so I took Lucinda and her friend Claire to Disneyland. Since Lucinda had made a big breakthrough at our last trip to Disneyland, she was ready to try out some more roller coasters. 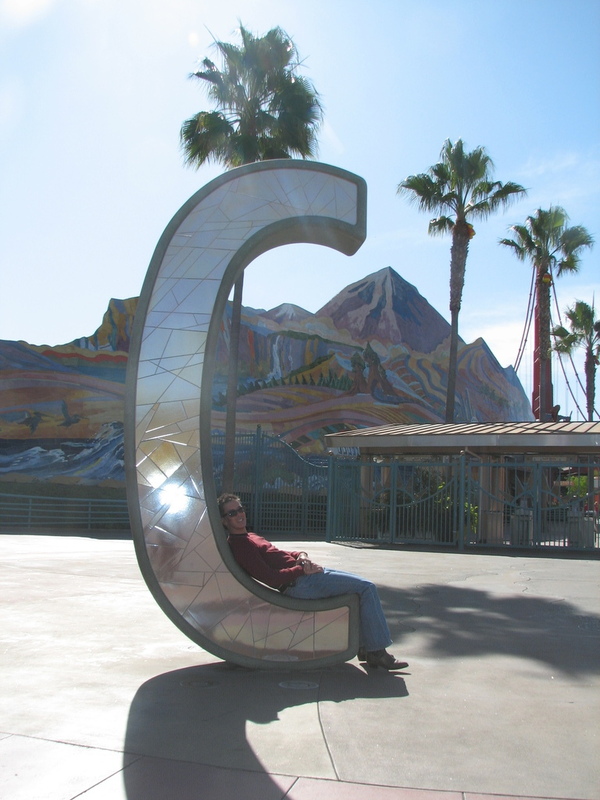 We went to California Adventure first, where we rode Mulholland Madness. They both enjoyed it. Next, we went to Toy Story Mania, and we got Mr. Potato Head to remove his ear. Then it was time for lunch, followed by Soaring over California. Next, we walked across to Disneyland. As has become our tradition, we went to Pirates of the Caribbean first. After that, we got Fastpasses for the Haunted Mansion and then walked over for a look at Big Thunder Mountain. They watched the train go by and decided they were up for it. So we waited in the very short line and then rode it. They both had a good time, although it was difficult to take pictures on the ride. 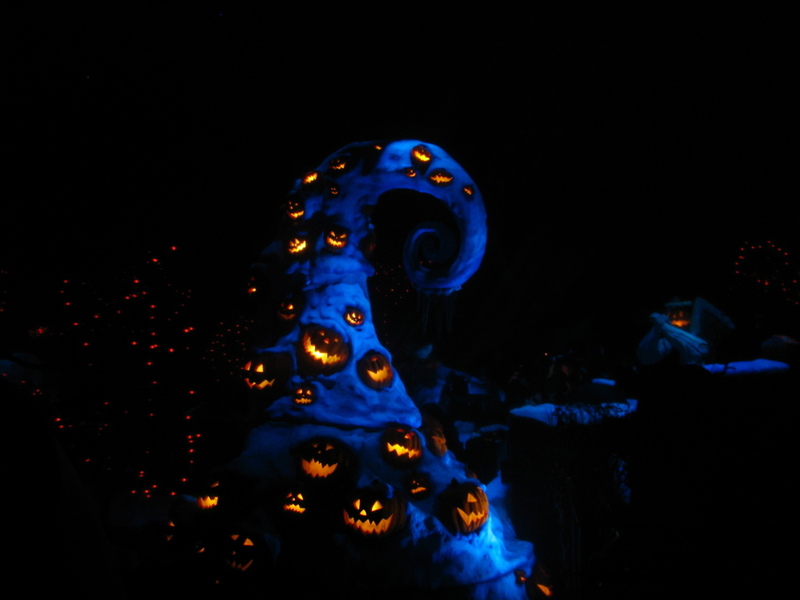 By then, it was nearly time for our appointment at the Haunted Mansion, so we walked back and did the ride. It was decorated for Halloween and Christmas together, just like last year. After the Mansion, we went to Toon Town to ride Gadget’s Go Coaster. This was the coaster that we persuaded Lucinda to try last time, and the reason she’s decided that she likes coasters now. We had fun riding it, and then they decided that they wanted to try the Matterhorn. The line wasn’t bad, and we got on in about 15 minutes. They both liked the ride, and decided that they wanted to do it again. So we got back in line. The second time, we rode the other side, so we got two different Matterhorn experiences. Finally, they were curious about the Innoventions building, so we went in. They played some video games and did a little karaoke of one of the songs from “High School Musical 2″. By then, it was time to leave. 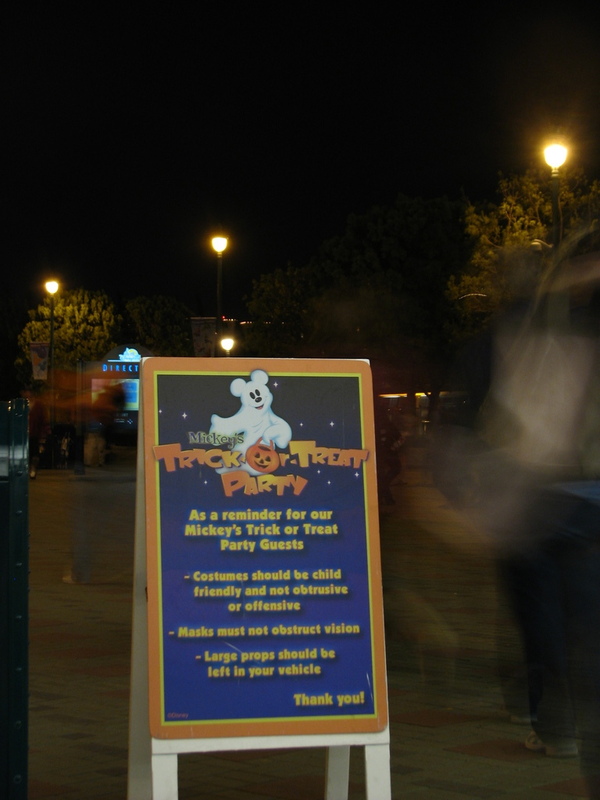 The park was filling up, due to “Mickey’s Trick or Treat Party” that was going on that evening. So it was a good time to go home. We had a nice dinner at the Jazz Kitchen in Downtown Disney and then we went home. It was a long, but very fun day. 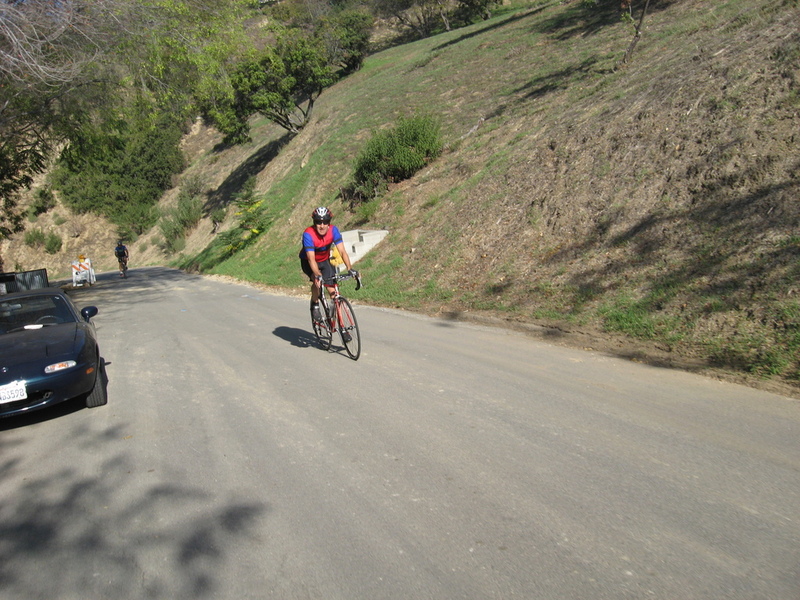 Sunday’s bike ride was our old favorite route through northeast Los Angeles, with a nice climb up Mt Washington. It was cool in the morning, but warmed up nicely. It was a perfect fall day. There wasn’t a lot remarkable about this ride. We did a slight variation on the route, taking different streets down the big hill. The change of scenery was nice, but the streets were pretty rough, so it was a real bone-shaker. Our snack stop was at Kaldi’s in South Pasadena. And then we just headed straight home from there. It was a very nice ride. Last night, I was at Club 705 in Hermosa Beach for Leslie’s sister’s wedding reception. 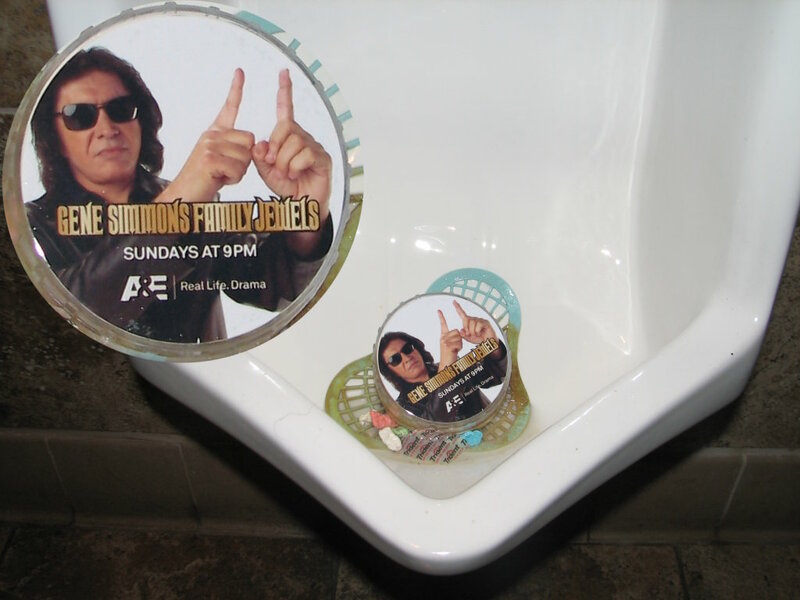 And in the bathroom, I saw a type of advertising I’d never seen before. It was a piece of previously unused space being recruited to sell a new reality TV show. 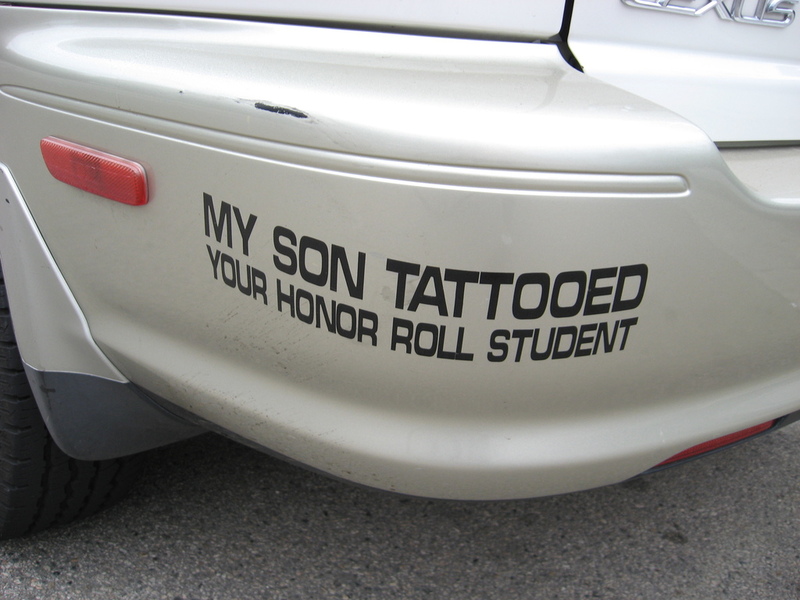 But it seemed strangely appropriate. 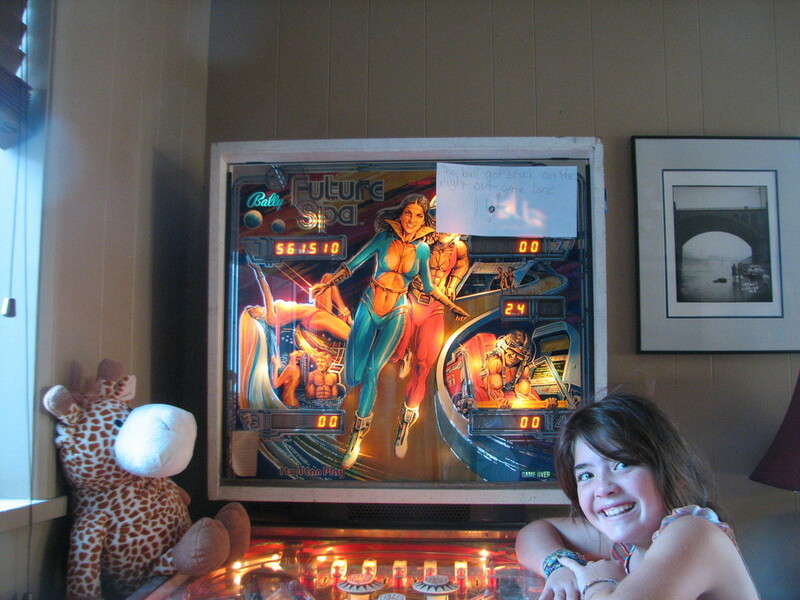 Lucinda and I were playing pinball this evening. She is getting to be very good at it, and she set a new personal high score of 938,320. Since we reset the high score recently, this is now the high score of record. Now the next frontier for her will be to roll it over a million, and I’m sure that’s not going to take long. In today’s obituaries, Vic Mizzy has died. We never knew who he was, but we all knew the songs he wrote. In particular, he wrote the theme song for the 1960s “Addams Family“. He also wrote theme songs for lots of other TV shows that I grew up with. So even though I never knew his name, he was part of the cultural landscape. The obituary also mentioned that he’s going to be buried in Eden Memorial Park, which is where Groucho Marx and Lenny Bruce are buried. So I’m seeing yet another sightseeing ride for the bike club soon. 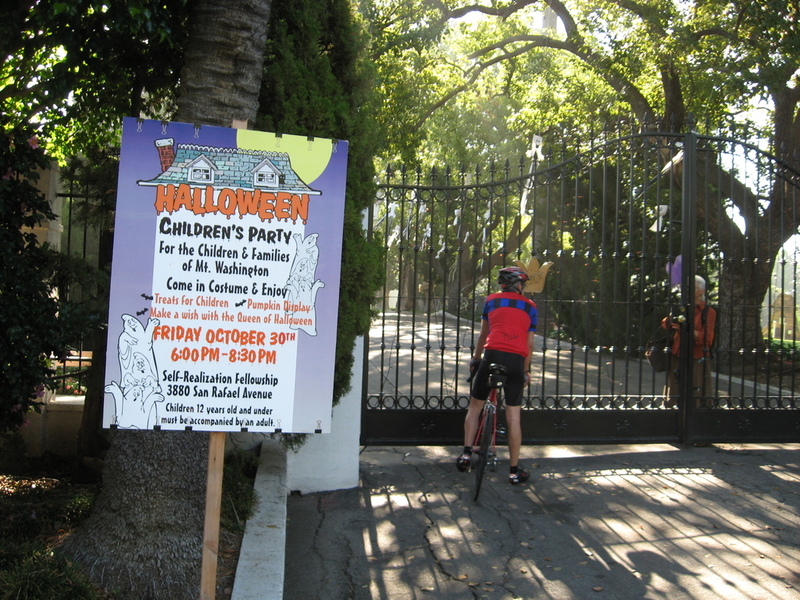 Today’s bike club ride was my “Down for the Count” route out to Holy Cross Cemetery in Culver City to visit the grave of Bela Lugosi. The last time we did this ride was two years ago. And with everything that has happened in my life since then, it seems like it was another life. So it was time to do this ride again. 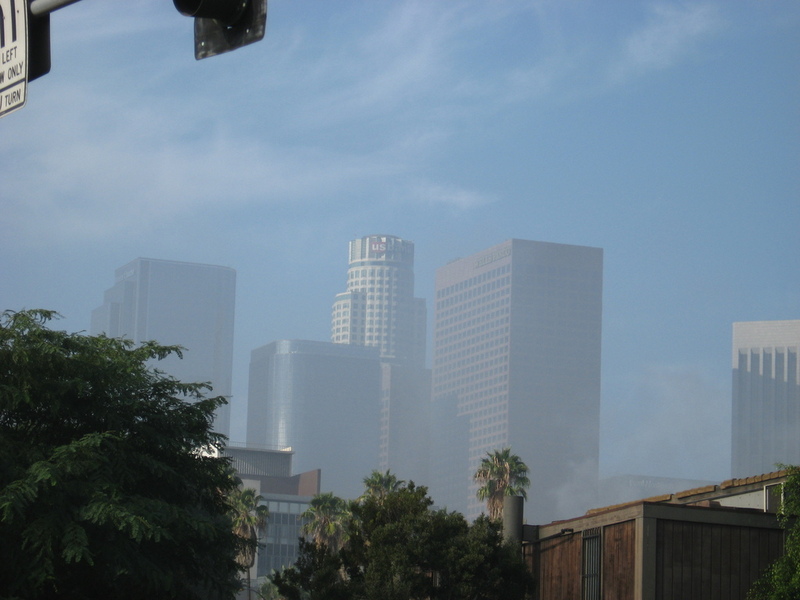 It was cool in the morning, and there was a slight mist around the towers in downtown Los Angeles. 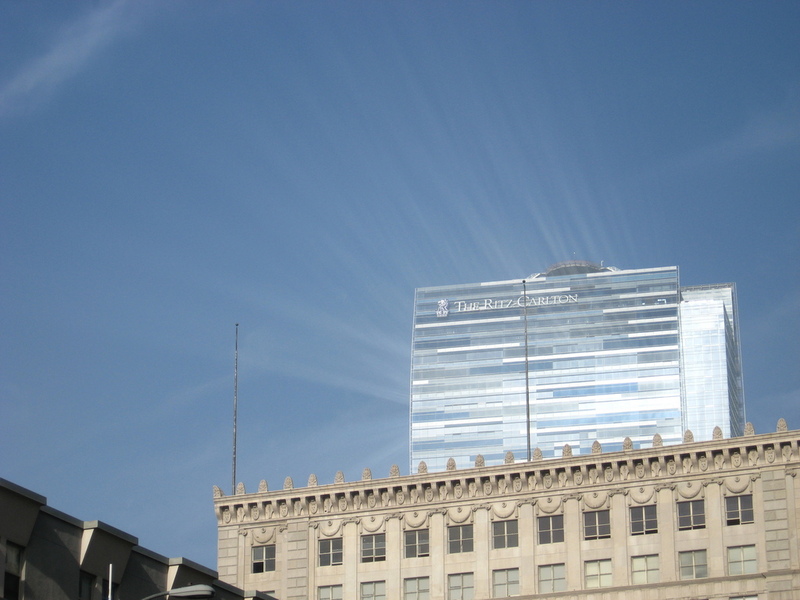 This combined with the morning sun reflecting off the windows of the new Ritz Carlton to make a very striking sight. 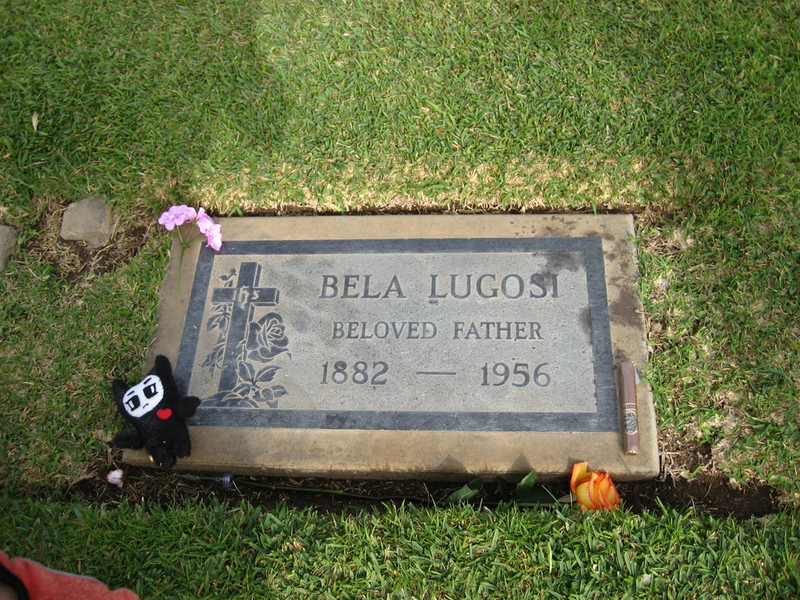 When we got to Holy Cross, we first went to the Grotto to see Bela Lugosi. Then we wandered around a bit near there, where we found Sharon Tate, Rita Hayworth, and Jack Haley. They have all been added to the Graves Gallery. On the way back, we stopped at Noah’s Bagels on Venice Blvd. 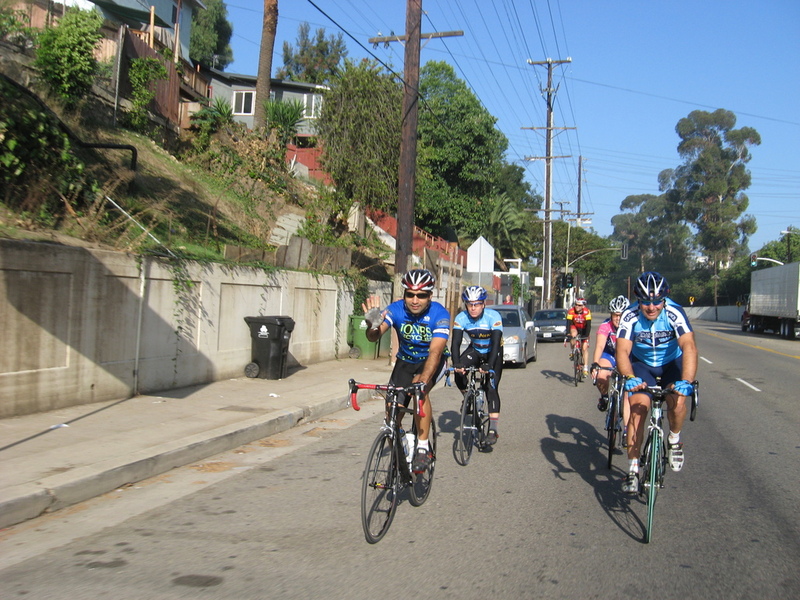 Then we rode Venice almost all the way into downtown, and then north to Silver Lake for the trip home. Once we got to Fletcher Drive, we were back on familiar territory. 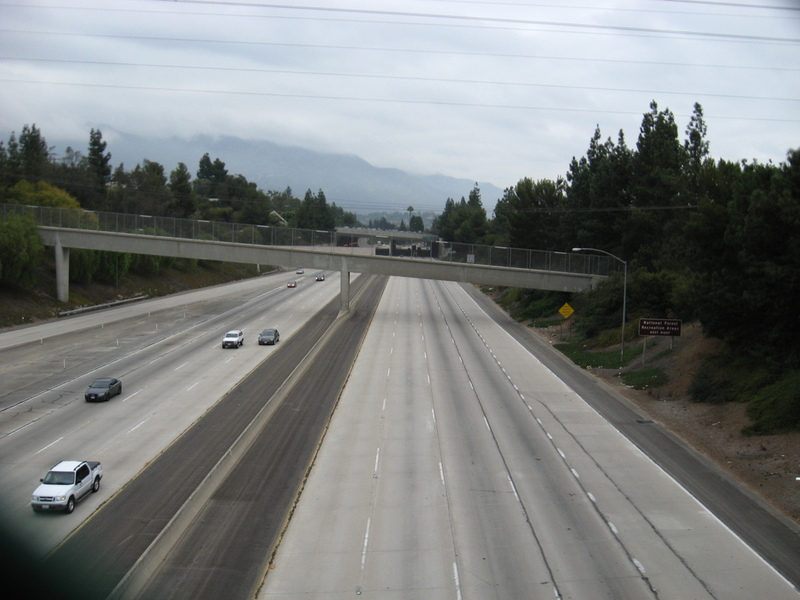 From there, we took the most direct route home, through Eagle Rock and up the Colorado hill into Pasadena. 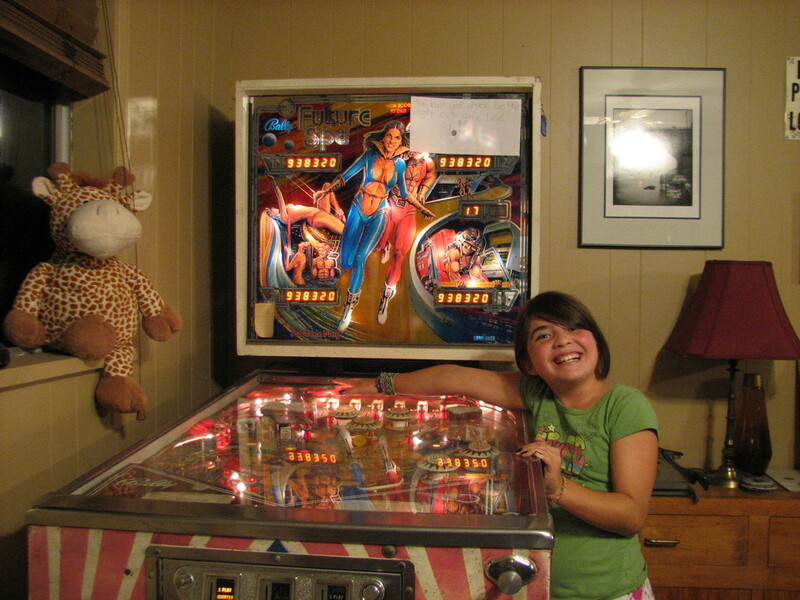 Lucinda and I have been playing more pinball lately, and today she set a new personal high score. Her previous high score that I recorded was 386,430 points, and this time she did 561,510. She says that she thinks she did 800,000+ once, but I don’t have a record of that. So I thought I should take a picture to record this occasion. 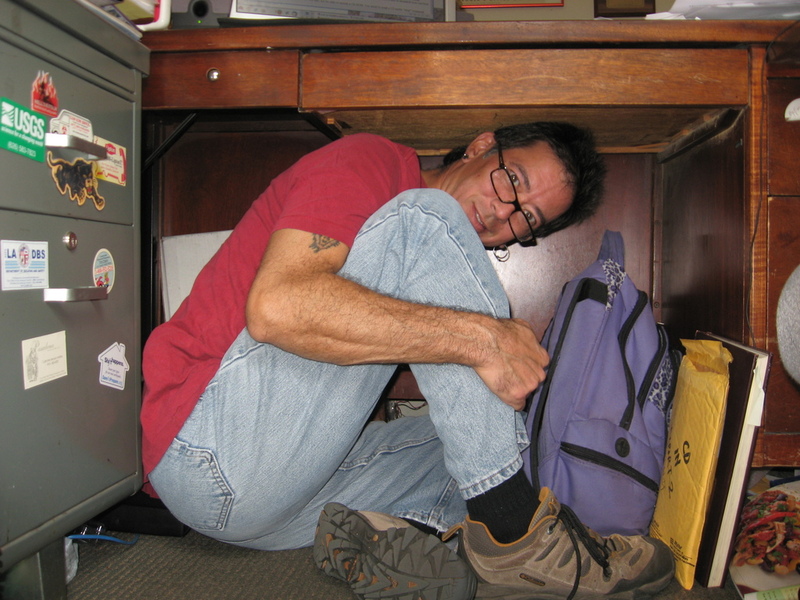 Today was the California Shakeout, so of course all of us at the Earthquake Hazards Office participated in the drill. And I found out that I can fit under my desk. 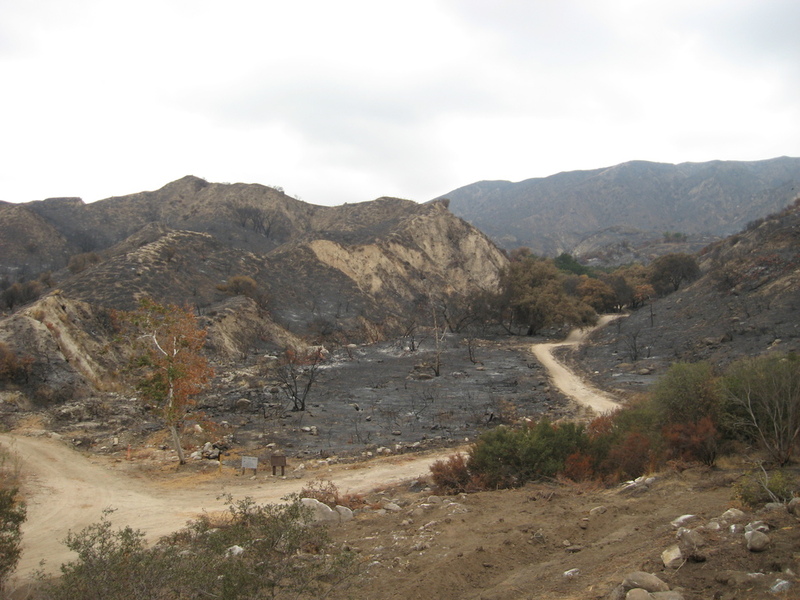 Last Friday, I went to a talk at Caltech about debris flows, and how they are almost certainly going to happen this winter because of the Station Fire. 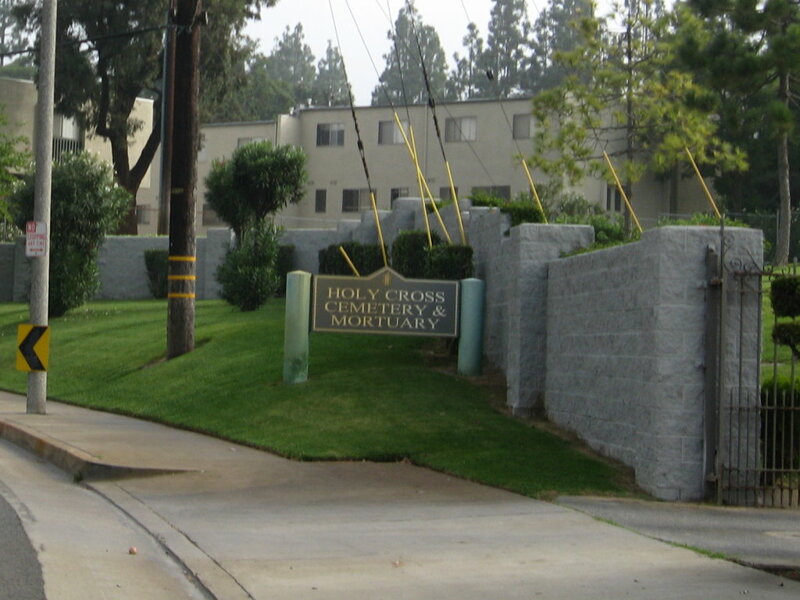 The speaker made mention of one particular house in Sunland. 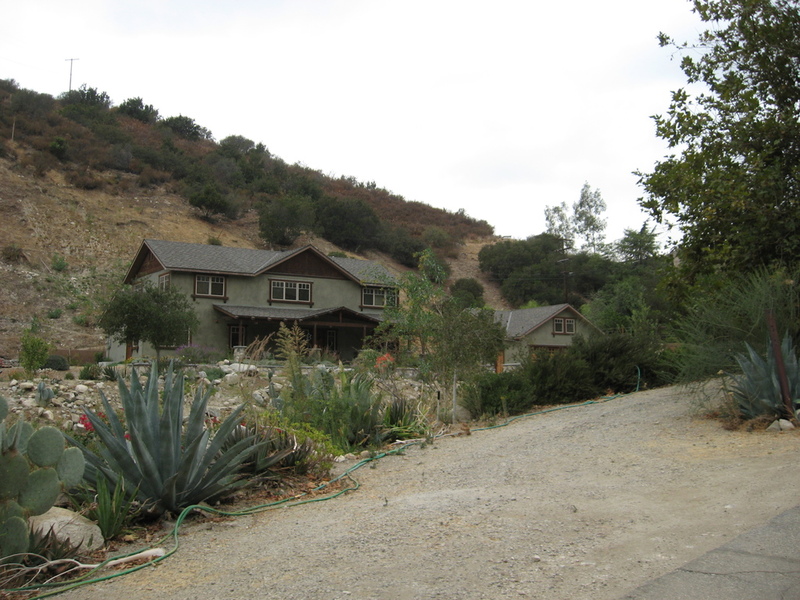 She said that the house had been destroyed by debris flows in 1978, and that it was then rebuilt in exactly the same place. Because of this, it is expected to be destroyed again when the rains come. So of course, I immediately looked up the address and worked out a bike route to get there and see it. I took the direct route there, since I didn’t feel like riding through Burbank and Sun Valley on a weekday. 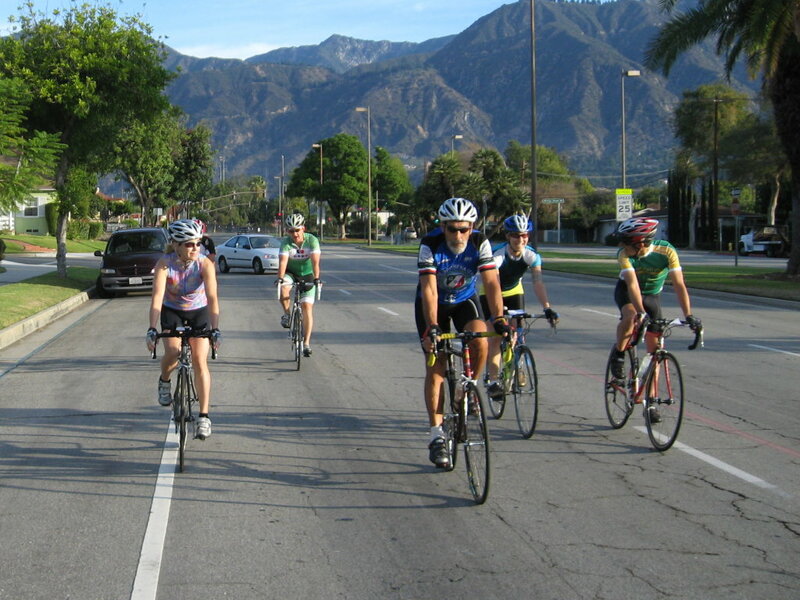 And riding up Foothill Blvd through La Crescenta and Tujunga was no picnic, either. 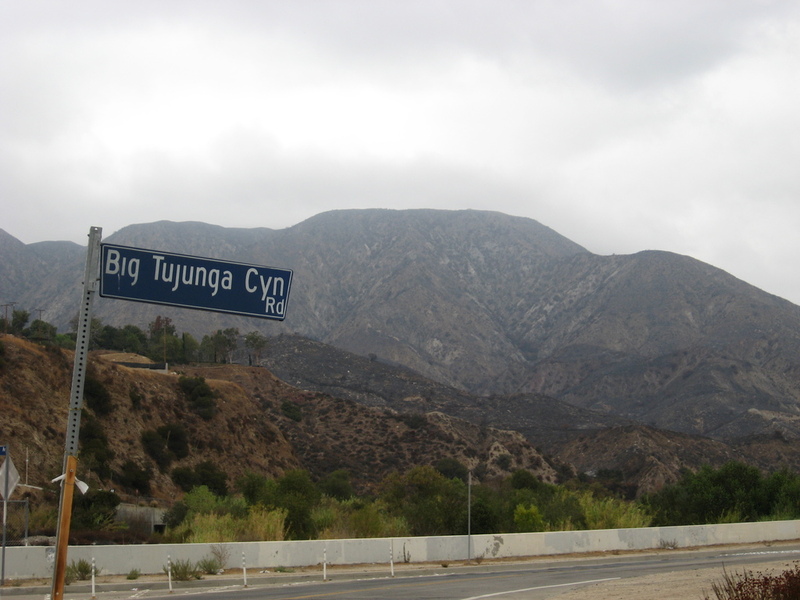 But I made it to the mouth of Big Tujunga Canyon and got to take in the charred mountain vista. It was impressive. Then I rode up into the little private neighborhood on the north side of the canyon. The fire had come down to within about 100 feet of the houses there, and the burned area looked pretty devastated. And when I found the house, I could see why it had been destroyed. There is a large drainage area above it, and it’s situated in a narrow part of the canyon. And there is no debris basin above it. Anything that comes down from that drainage gets funneled through the canyon where the house is. I suppose the owners know this. Aside from mud and rocks destroying the house every 30 years, it looks like a very pretty and idyllic place to live. 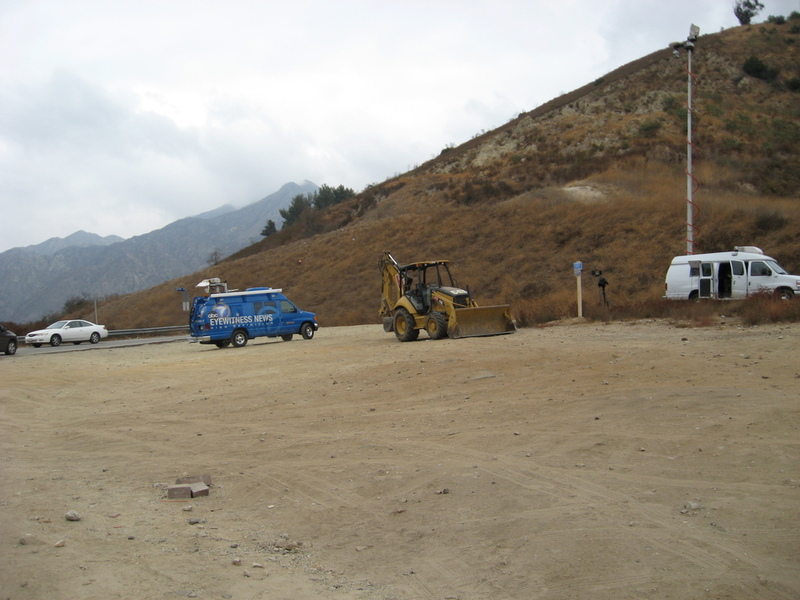 On the way out, I saw two news trucks parked at the mouth of Big Tujunga Canyon. The first rain of the season is predicted for tonight, so they may be setting up to see the first mudflows. It was an interesting little sightseeing ride. Addendum: Here’s the Google Maps view of the terrain there, and you can see that there are two big canyons north and northwest of the house, and both those merge into the narrow canyon where the house is. Check it out.